In cases where decay or physical trauma results in missing teeth, there are a number of treatment options available to replace them. At V Care Dental, we offer affordable dentures that are suitable for people of all ages. An easily removable appliance, our dentures provide a convenient replacement for missing teeth without interfering with speech, chewing, or the aesthetic appearance of your smile. 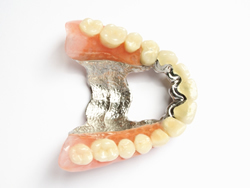 Depending on your requirements, our affordable denture clinic offers two types of dentures. If you need to replace one or several teeth, we can provide a partial denture that maintains the integrity and function of your remaining natural teeth. If you need to replace all of your teeth, we can also provide a full denture that will allow you to carry out activities with ease and comfort. Whatever your needs, you can rely on our dentists to deliver a tailored solution that meets your specific needs. V Care Dental is the number one destination for affordable dentures. To learn more or schedule an appointment, give us a call on (03) 9783 2747 or (03) 9772 7175. Alternatively, you can fill out our convenient online contact form for a prompt response.